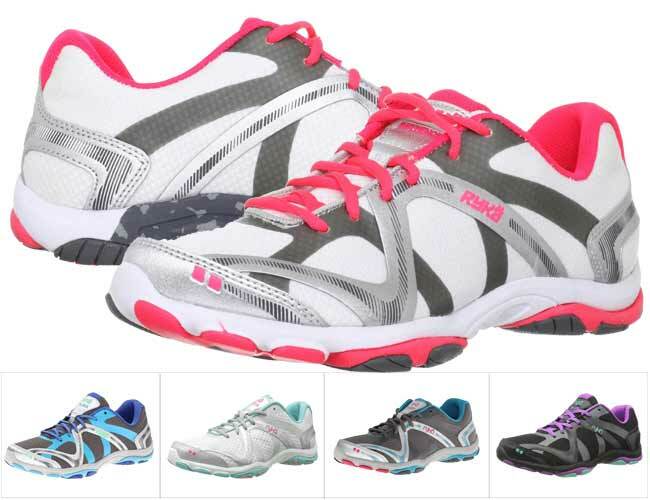 For improved performance even in the most intensive workout, try these Ryka Influence Shoes! They are light, and yet offer sufficient support, stability and traction to keep you safe during training. Their nice cushioning and added snug fit by the padded tongue and collar, as well as the special technologies to improve arch support and get the best responsiveness used for the midsoles and soles, will reduce the fatigue and pain you may be experiencing in your heels or legs after intensive training. Plus, these training shoes look very nice, they have a breathable upper, and overall will provide you with the ultimate comfort and best treatment for your feet. These lightweight, bouncy, colorful training shoes are the perfect shoes for Zumba. They have a unique insole which is amazingly bouncy and responsive during intensive training. The outsole features a footprint design which is not only cute looking but offers great traction and a good and safe grip to keep you from slipping and falling while exercising. The upper is made of a combination of synthetic and mesh. It offers a nice tight fit, which is complemented by the padded collar and tongue adding to the snug and more comfortable fit. The upper is breathable, so you shouldn’t worry about your feet emitting a foul smell when you remove them in the dressing room after class. These pretty sneakers will provide the comfort, great cushioning, added arch support and stability to make your training sessions and Zumba classes feel better and more enjoyable. The flex-foil, direct-fuse support layers, and the dual-impact midsoles offer amazing support and stability to the feet and ankles. The secure footbed, increased instep volume of these shoes, as well as the wider toe box make them amazingly comfortable and safe to wear. Plus, the light weight, the excellent responsiveness and the great grip of these shoes will definitely help improve your performance. It is highly likely that at first you will not like them when you try them on, but the combined stability, support, excellent traction, nice fit, light weight and the much improved cushioning will help you play better than ever. Want to see another option? Go check The Rockit by Capezio or ..